Hello, Monday. You’re Not an Afterthought. We roll out of bed on Monday and plunge headlong after our agenda. We’ve got a list of things to do and a full week of tasks and most Mondays start with tackling the list. My Sunday night washed into my Monday morning and I woke up with such sadness. I was in the middle of the post-church lunch prep yesterday when my phone buzzed. I didn’t recognize the number so I let it go. A few minutes later, it buzzed again. Same number. They’ll leave a message, I thought. A few minutes later, my phone buzzed a third time, but again without a message. I put down the spatula and called my friend, who shared that her sister-in-law, the wife of a long-time family friend, had died in her sleep. She was 45 and left her husband and two boys. We talked and cried and I tried to share what the family might be feeling and needing right now. I grieved it all afternoon and into Monday morning. My stomach turned as I thought of the anguish the husband and sons would walk through. It brought me right back to the shock and pain of our first days after Dan died. It was hard to get started today. But this Monday has already been planned by the Lord. This day where a husband will pick out a casket and pull pictures from a life together and pick out favorite hymns is hemmed in by the plan of God. God has allowed it. And in perfect faithfulness, God also long ago planned his marvelous works right in the middle of the hard. My friend will see hard, but he will also see the marvelous works of God, planned long ago for him and for his sons. Maybe you saw the Lord’s good hand last week. You saw Him provide for you in a mighty way or saw Him very clearly direct your path. Maybe after lots and lots of prayer a situation has finally resolved or maybe He met you so personally and tenderly it’s hard to even explain to anyone else. Those mighty works didn’t just happen. They aren’t an afterthought by God as you sent up prayers of need. They aren’t His rescue because He was otherwise employed and suddenly perked up to your cries for help. They were planned long ago. Ages before the calendar ever rolled over to this day, God planned His marvelous works. Whatever we’re facing today and whatever we encounter this week is already known to God. In fact, it’s been written on His agenda, part of His plan for us. Whatever you hold for us, God is already there, He’s already on it and He’s already got it. God has the exact wisdom and provision and equipping we need for today. We can praise Him before we ever see the first glint of His mighty works. If you’d like encouragement right in your inbox, subscribe here and I’ll send you my FREE 100 Days with Christ Bible study and journal. Good morning, I,needed,this this morning! God is already there, He’s already got it! Whatever my needs are HE will meet them. Whatever my wants are, He will decide if they’re right for me…now or ever. I will trust and have faith in his guidance. Yes! Isn’t it amazing how knowing that God holds all of it sovereignly strengthens our faith to walk it? Thank you, Kimberly. 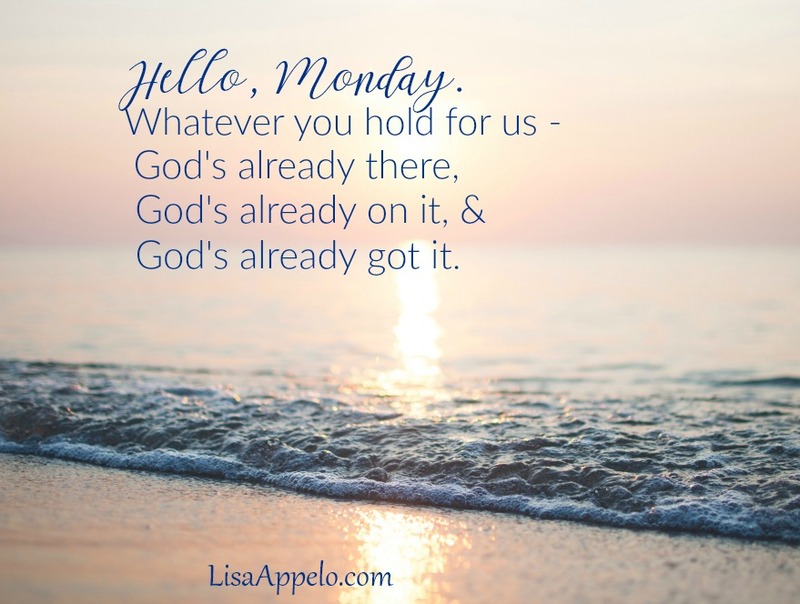 Oh Lisa, God knew I needed this today. Thank you. I am praying for this husband and his sons, that God will comfort, as only He can. Love you. Yes, God is the only real comfort for sure, Pam. Thank you! May He be with you today in the journey. Of course, He already is 🙂 so rather…may you be strengthened even more, attention turned to something he wants you to see, understand, or experience. Thank you, Brinly. I’ve learned to turn my prayers inside out just like that! Thank you, Lisa! Monday morning started with a jolt, and unexpectedly rumbled toward an explosion. The day may not be what I had planned, but you remind me that GOD knows the plan, and he will see that the good works he has begun in my family will follow through to completion. Thanks again for the message, and thank God he has us in His hands! Oh Lisa, I’m so sorry for the loss of your friend’s wife. So hard. Just 10 minutes ago I was thinking of you and what a strong woman of God you are—as I was pouring a Zevia! Lisa, His Majesty has been displayed beautifully in and through you. I thank God that your friend had you to come to in this hard trial, and that you can point them to the comfort of the One who truly comforts us—even when death taunts and sends us swirling. I will be praying for you and your friend and his family. I appreciate you, Kristi. I’m so mixed when I learn this kind of news — on one hand, it’s devastating to the family; yet on the other, I know they will see God’s incredible faithfulness in all new ways. Good morning, I did not see this until today, I was very busy putting up hurricane shutters because I live in the path of the storm. This message is exactly what I needed. This is the week i have dreaded all year. One year ago Oct 10th I lost my loving husband of 42 years. Each day with God and my wonderful online friends, like Lisa, I am taking small steps forward in this new life, a life I did not plan. I am learning that worrying means I question or do not trust God. 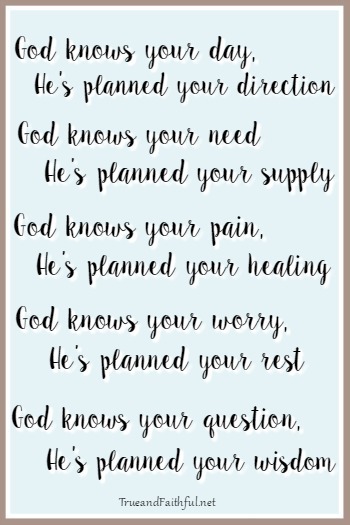 God has plans for me! I saw your title and FB posts on Monday and have wanted to come ever since and read. I’m so sorry about this man’s loss and yours. So hard and I can imagine how hearing that weighed you down. Thanks for reminding us God planned our days long before we walk in them.